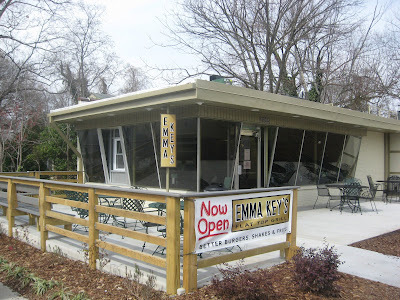 I'd been wanting to visit Emma Key's Flat Top Grill. 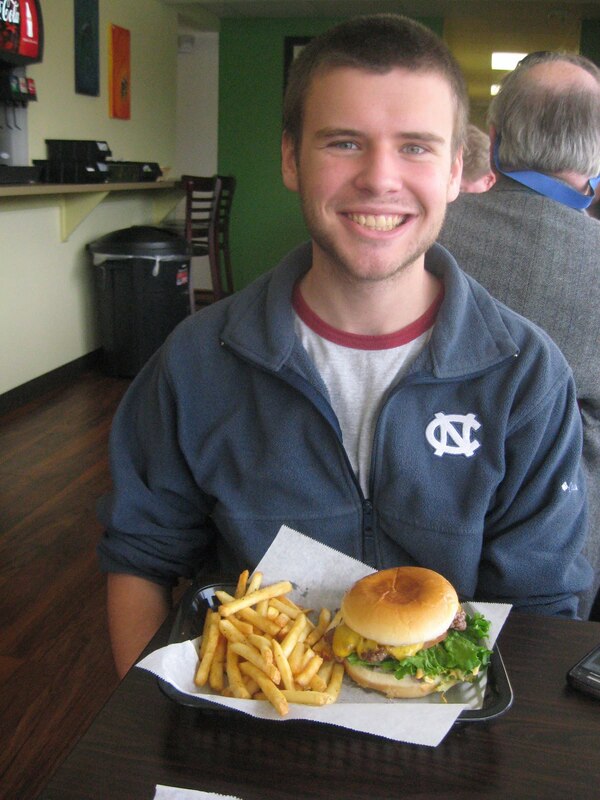 Since my son needed to drive back up to UNC to get some paperwork and he goes right past Greensboro, NC I hopped a ride and treated him to burgers at Emma Key's. Emma Key's is just a couple of miles off I40 at the corner of South Elam and Walker Avenue. It's actually one building down from the corner, and the building used to house the local barber shop. 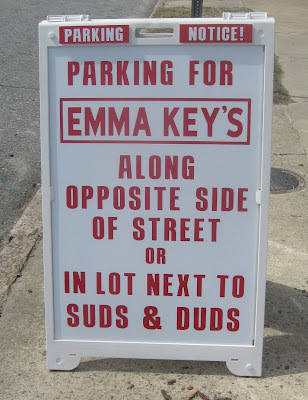 If you're at the intersection with Emma Key's to your left, turn right and into the roomy parking lot for Suds and Duds. 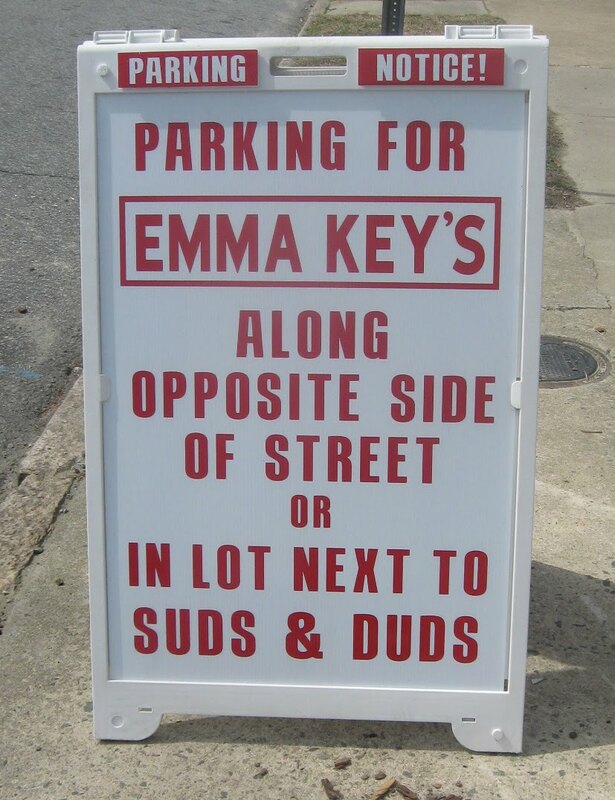 Emmett Morphis rents spaces for patrons to park there, since there's no room for parking on the Emma Key's lot. No biggie. But, I've seen a few folks going hissy fit on that. Come on. It's probably, at most, a 100 feet or so to walk down. Or, you can legally park on the far side of the road. Try going to a big city and getting parking period. We're kind of spoiled in North Carolina. Inside there are 5 tables for four and 8 bar stools, but they also have picnic tables out front and to the side. It's not a huge place, but then again, I prefer little spots where I can hear myself think and where you don't have to wait FOREVER to place your order and get your food. Caleb and I looked over the menu and had a hard time deciding, since everything sounded really yummy. 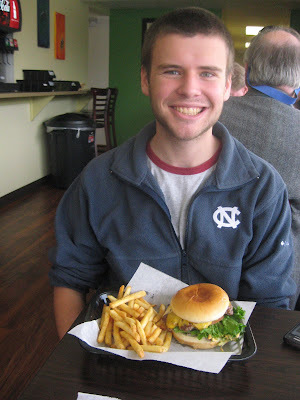 Caleb went with the Flat Top Cheese Burger, and I had the Lou Lou (which is a burger with homemade pimento cheese made from Emmett's grandmother's recipe). While the burgers were being grilled up on the flat top, we shared a cheese appetizer. 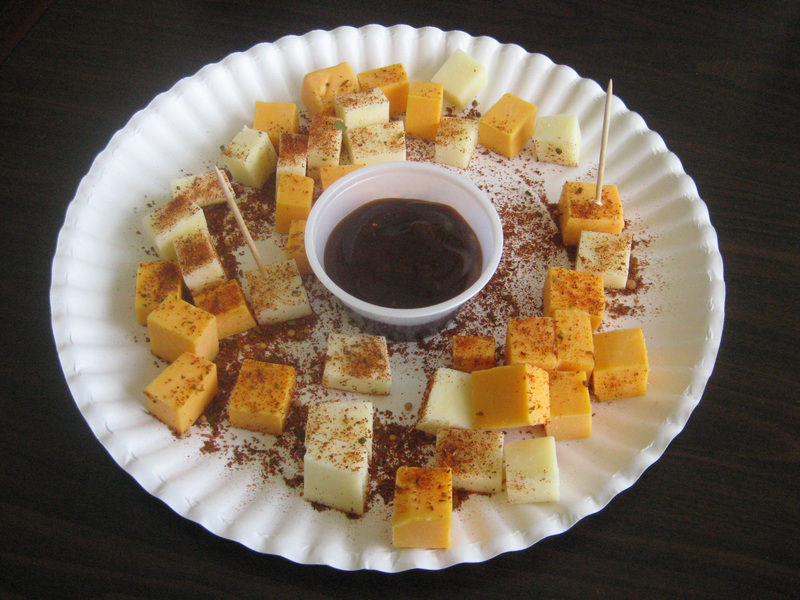 That included blocks of cheese sprinkled with some lightly spicy seasoning and barbecue sauce for dipping. I had not thought of this combination, but it was good, and I'll have to remember that for parties. It's a nice appetizer and would be easy to put together. Although I don't usually mention that I'm a food and cooking writer, in this case, Emmett and I had been in contact through a mutual friend Joel Leonard, so it didn't make sense to stay undercover. Also, in such a small place, it would have looked rather odd to be taking photos. 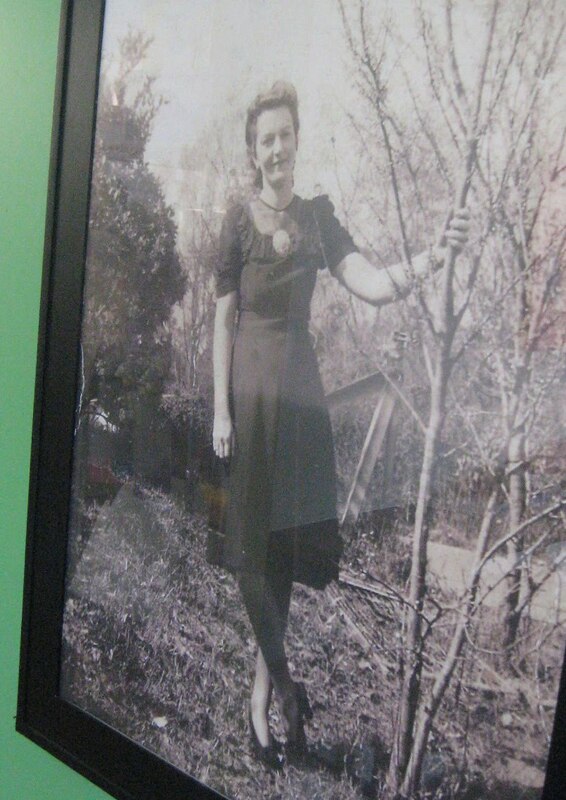 Emmett and I chatted, and he pointed out his grandmother's photo on the wall. She was certainly a beautiful woman, and I can vouch for her pimento cheese being the max. There is no comparison between real pimento cheese and the plastic tub variety (which I do not like). 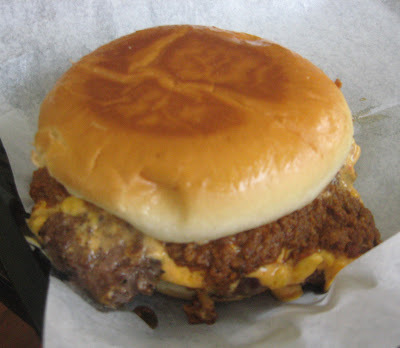 On the burger list, Emmett mentioned that the Graham Grilled Cheese sandwich is named after his oldest son and that the Liam Burger is after his next oldest son. Those meals are on the kid's menu which is very reasonably priced and come with fries or apple sauce on the side. The hot dogs are literally named after Emmett's dogs. I had to laugh on that one especially since one is called the Sophie which is Caleb's girlfriend's name. We have pinkie sworn not to tell her that. 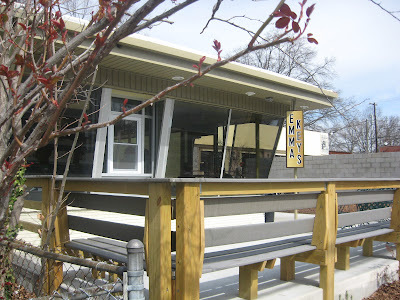 Burgers, hot dogs, and fries (including sweet potato fries) take center stage at Emma Key's, but there are other things as well like the soup of the day (need to ask what it is on any given day), salads, and vegetarian dishes. 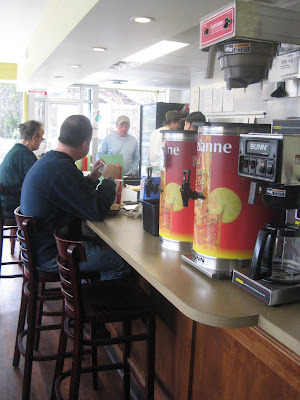 You can get an old fashioned milk shake or malt with your meal or to finish it off, and they have a Brownie Sundae and pound cake by Kristen Robson or Lisa LeBlanc of Babycake Sweets that is heated on the flat top grill and served with ice cream. That was calling my name, but I was full up to my eyeballs on the Lou Lou burger. My plan had been to drink water which is what I usually have with meals. At my height, I need to watch calories somewhere. 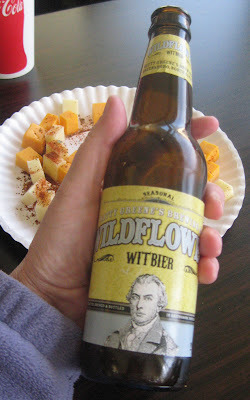 But, I noticed that they had a local Greensboro beer on the list - Wildflower Witbier. That is made at Natty Greene's Pub and Brewing Company. It was served up in a bottle with a slice of orange. I can say that Wildflower Witbier does taste rather flowery which should come as no surprise. It was interesting, and I'm glad I tried it. The flavor was a tad too perfumey for me. It's a beer that I'm glad I didn't miss, but it's not one that I'd not order again. I was rather tasting flowers the rest of the day. Caleb and I had a fabulous lunch and just an all round great time at Emma Key's Flat Top Grill. The burgers are hand patted and nice and juicy. That pimento cheese I had on mine was to write home about - really sensational. Next time, I really want to try the sweet potato fries which looked outstanding. I could not help but stare at the woman's plate at the next table, and my mouth is (even now) watering just thinking about that grilled pound cake with ice cream. 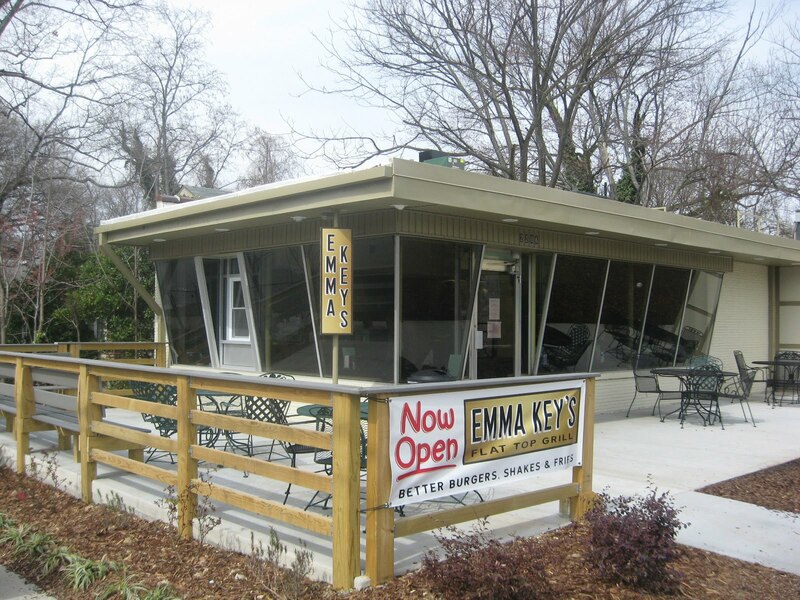 If you're looking for a terrific burger made to order and some interesting topping options, then I highly recommend Emma Key's. Just make sure to go hungry. Everything looks so wonderful that you'll find that your eyes may be bigger than your stomach. I'm still thinking about those sweet potato fries. They are definitely on my list to order next time.